Unfortunately many babies and young children succumb to heatstroke every year while sitting in their car seats. 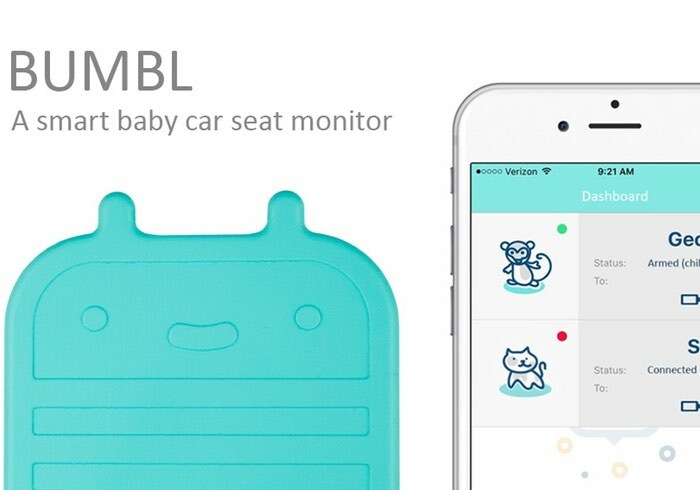 One company has now created the Bumbl Baby, a smart baby seat monitor to help prevent heat stroke fatalities. The Bumbl Baby smart baby seat monitor has been designed to work with any car seat model and comes complete with its own smartphone companion application that allows you to be notified when anything untoward may be happening. Watch the video below to learn more about this innovative smart baby seat monitor which is launched via Kickstarter this month to raise the $55,000 it requires to go into production. Its developers explain more about its inspiration and design. It is both surprising and unfortunate to learn how many babies and young children in cars succumb to heatstroke every year. Many parents do not believe such an incident could ever happen to them, but the majority of these heatstroke deaths are completely accidental and happen to all demographics, regardless of profession or income. Many people think, “I would never do this!”, and the parents of the children it did happen to thought the exact same thing. But it can take as little as 15 minutes in a hot car for a child to suffer life threatening injuries. So our motivation behind the Bumbl project was to help prevent these tragedies and hope no one has to read (or write) another article about a child being left inside the car. So what is Bumbl? In a nutshell, it’s a small bluetooth device placed in your car seat that detects when your child is present (or not present). It pairs with a smart phone app that will notify you in the event the child is ever accidentally left in the car. If you do not acknowledge the alarm, your emergency contacts will be notified with a text message and GPS coordinates of the last known location of the device.